Lila Stern-Shewry is an artist who designs and makes contemporary jewellery as an art form. Using sterling silver, gold and semi-precious stones, she creates large abstract “organic” forms. Using techniques such as granulation and wirework, the stones are surrounded by unique designs. She also deals with astrology, human design and other spiritual practices. The astro chart presents the star sign of each artist in the residency and it shows where is the SUN /the ego or the personality/. 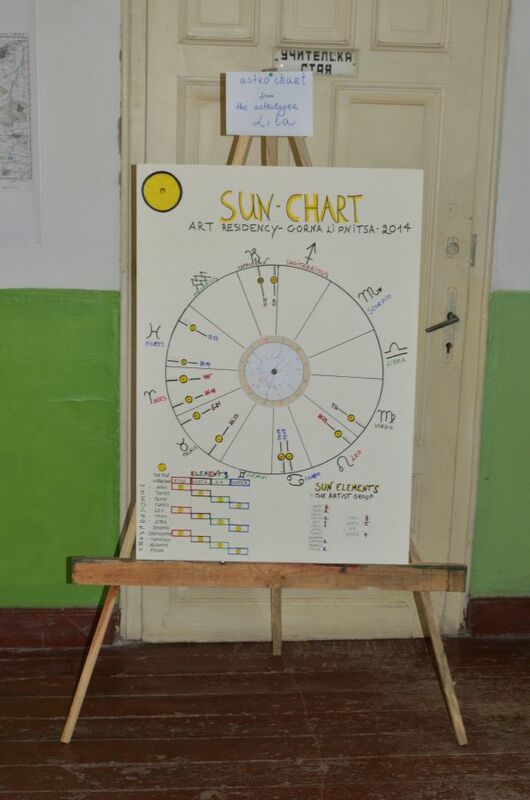 The idea is by using astrology to be understood how the group of artists is working together. An unique combination of elements – earth, water, air and fire – can be seen on the chart to reveal us the qualities of this group.